Its common knowledge that saving energy in any form is a good thing, be it energy saving lights or simply not being wasteful with power. But is there something to it? A few cents here and there isn’t much. In fact, it can have a tremendous effect on the amount of power that you use (and pay for) and the amount of CO2 emissions that are produced from the generation of said power. An example of this would be one of the 1.5kw solar systems that is installed on one of the units. The system was installed in June 2012 and the 1.5kw system has produced 6917kw. If that is averaged out at 26c per kw/unit of power, the system has produced $1798.42 of power. That is 1/2 of the system cost, over 2.5 years, But also 6474 tonnes of carbon that has not been released. This is just for a basic system. Solar system has a designed life of approximately 15-25 years depending on the quality of products used (German/Chinese argument). If the system pays for its self over 5-ish years, you will have a minimum of 10 years, most likely 20 years of power production. 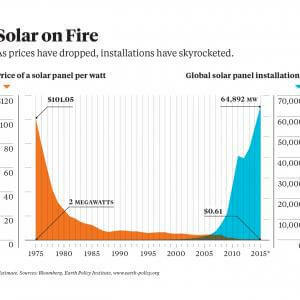 But as with technology, in 15-20 years’ time panels may be 1.5kw each opposed to 250w each by then. Renewable energy is not just limited to solar power. Since Perth is located on the coast, we experience large winds, and wind power can have a tremendous impact on your renewable energy production. A special inverter is used, and if the power is fed into batteries you can tether it with solar system to have renewable power at night as well. Many turbines are not intrusive are silent if VAWT (Vertical Axis Wind Turbine) are used, they can sit on your roof and you can have multiples. The State and Federal governments have been trying to push both the reduction or increase in renewables (depends on what day you read the paper), but no matter how you look at it, green is good. You save money, the environment is helped and Western Power has less grid imbalance. But you need a system that will give you the best returns. Farmers have large fields where arrays are turbines can be erected, but the average home cannot, but by maximising solar energy and a small wind turbine, you can not only wipe your bill, but also be in the next generation of green power for domestic use. Thinking about installing renewable energies is liking thinking what car to buy. If you purchase a horrid little econo-box you’re not going to get something that is reliable, or pleasant to look at. But if you do the research into what will suit you best you will have a system that will maximise returns and give you the feeling that your actually helping. I may not be solar, it might be wind, you will be installing a system that is designed to what is best for you, not a “one size fits all” copy of a system. Don’t be fooled by the sales gimmicks, get what you want and suits you best.